Our secluded cottage faces south overlooking the bay, islands, and working lobster boats. The front deck is ideal for lunching, sunning, and watching nature at play and joins a grassed lawn perfect for games. Stay cozy on a cool evening with a small gas stove. A short drive will take you to all the festivals Rockland has each summer weekends as well as the Camden/Rockport harbors, home to the schooner fleet. A nautical museum, general store/cafe, post office, library and great fishing are within walking distance. Launch your kayak and explore the shoreline. 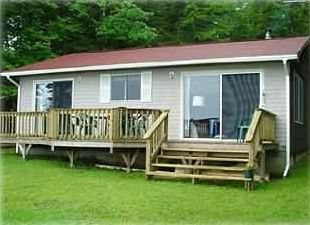 Keywords: Cottage with water frontage. I am a real estate agent and own investment properties. The cottage is intended to be a retirement refuge. In the mean time it is great fun to share with many guests who love it as we do. This cottage is the perfect hide-away. Quiet and beautiful, a real escape. Excitement and entertainment are within a short drive. We are pet friendly and it is a safe and exciting place for good dogs to play. We have also entertained cats! walk 1 mile to a quaint village with library, boat launch, restaurant/general store and a nautical museum. Gorgeous clean sand surrounded by smooth ledges to climb. Public toilet facilities. Walk along the rocky shore to find driftwood and shells. Some firm bottom but mostly soft. Dig clams and launch a kayak. Gas cook range with oven. We try to supply everything necessary. Fresh blueberries to pick in season. Kayak from property. I hesitate to write this review and give any stars, because I want to keep this place to myself! Just returned from a week at Hawkweed (I think it's my 4th or 5th time....) and it was perfect in every respect. The cottage is exactly as pictured, so no surprises. It is immaculately kept and maintained., plenty of clean towels, hot water, nicely stocked kitchen area - everything you need for a comfortable stay. Simple, very clean, and a perfect secluded location with a fantastic view of the water; just a few minutes drive to Rockland for restaurants, museums, shops. My pups love it there (they think it's home). You can kayak from the property but it's not a swimming beach (you can get to one in just a few minutes by car). For me, the best part of Hawkweed is the secluded location, close to activities but a world away when you want to come home to the peace of the water. I've already booked for next year (again!). Thank you so much. You are a charming guest. We always look forward to your visits. Thoroughly enjoyed our stay . We loved the private location. The cottage is outstanding, high quality bedding, towels & dishes and is spotless. Lily (our dog) especially appreciated Elaine's thoughtfulness of providing a dog blanket and toys. We could have just sat on the porch all day. The view was spectacular. Hawks, eagles, sea birds fishing all day and of course the lobster boats. Definitely will be back. We much appreciate a glowing review. We always try to fulfill guest's expectations. The repeat visits make us feel like family. Everything you need is provided. Gorgeous spot and dogs had a blast! Great location for exploring and easy access to boat ramps. Always a pleasure ! Comfortable accommodations, beautiful setting with breathtaking sunrises and sunsets. Very private location with no light or noise pollution - heaven. Our small dog enjoyed the yard. Very convenient location for travelling the coast of Maine, both north and south. We have already reserved for next year! This was our second year at Hawkweed and we had a wonderful time. It's a great place for dogs and ours took full advantage of the swimming! A great place for kayaks as well. We enjoyed watching the changing view, including herons and hawks. The location allows is very private and close to nature, but just a few minutes to Rockland and great shopping, especially for seafood. Don't miss the Farnsworth, great art galleries and the Olsen House. The owners are lovely! We returned again to our favorite escape location. Hawkweed Cottage has always been a great escape. We celebrated our 46 year Anniversary while we were there. We love watching the lobster boats leave in the morning, and return hours later. It was really magical when we were socked in by fog, and could barely see the boats as they coasted by. Dinners in Camden are always perfect, and time with our Daughter and Grandson......priceless! Photography Workshop, Lighthouse Tours and Bird Watching in the Adjacent Nature Preserve. Boat rentals available in Rockland. Furniture and boat building schools nearby. Scenic train rides along the coast.